The Republican Party has taken heat lately for lack of unity surrounding illegal immigration. Last week's Conservative Political Action Conference (CPAC) established there is one thing Republicans can agree on: defunding Obama's executive amnesty. An overwhelming 77 percent of attendees agreed Congress must act to defund the president's actions. Sen. Mike Lee (R-Utah) was the first speaker to directly address immigration, stating "We have to use the power of the purse. We have to withhold funding when the president does that." Lee, a usually calm presence, was clearly emotional regarding the issue as he emphatically stated, "If you are asking whether or not I will vote to fund the president's executive amnesty, no I will not." The statement was met with applause and cheering, even bringing a few to their feet. Regarding executive amnesty, Lee also pleaded, "We've got to get back to our separation of powers." Drawing on his own experiences as the child of immigrants, Gov. Bobby Jindal (R-La.) also expressed passion surrounding the immigration issue. He told the audience, "We in the West have a responsibility to assimilate and integrate. ... There is nothing wrong with saying that if you want to come to America, you should be an American." During the Q&A portion of his speech, Jindal was pressed to explicitly address the president's executive amnesty. Without hesitation, the governor responded, "It needs to be repealed. We elected these Republicans. They told us if we gave them the Senate majority they would stand up to this unconstitutional, this illegal act. Presidents disagree with Congress all the time — they aren't dictators. They don't just get to decide what law they uphold and what law they ignore." It was no surprise that Sen. Ted Cruz (R-Texas) incorporated a strong no-amnesty stance into his speech. The senator also pointed a finger toward Washington: "Unfortunately, Republican leadership is cutting a deal with Harry Reid and the Democrats to give in on executive amnesty." Cruz's next line was met with vigorous applause and shouts of agreement: "Washington wants amnesty, but the people want rule of law." Former Gov. Rick Perry (R-Texas) joined his state's senator in condemning Washington, "They talk and people literally die. You don't trust Washington to deal with this — I don't trust Washington to deal with this — until they secure the border." Other candidates, such as former Gov. Jeb Bush (R-Fla.), did not display the same enthusiasm in opposing the president's amnesty. Instead, he argued that "We should give them a path to legal status where they work, where they don't receive government benefits." Bush's response was met with loud boos as well as scattered applause, the latter perhaps from the paid supporters he bused in. Laura Ingraham, conservative talk show host, gave the audience something to support, not just join in mutual disdain. In her praise of the United States, Ingraham stated, "American citizenship is not something that should be easily bargained away. American citizenship means something — it's not just a piece of paper." Ingraham's fellow talk show host Mark Levin mirrored her passion: "We are not a nation of immigrants. We are a nation of citizens. I am sick and tired of the American citizen being demeaned and treated as a second-class citizen." For a supposedly divided party, the message seemed very clear: Conservative Republicans oppose the president's actions on amnesty. 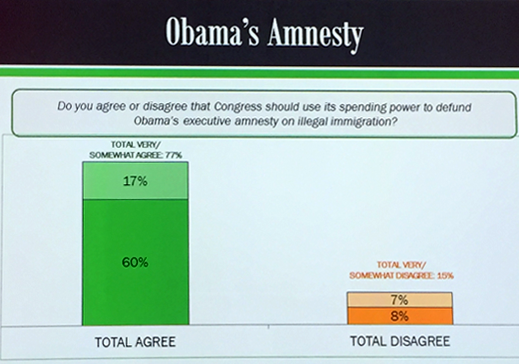 Grassroots Republicans are not divided on immigration, especially not on Obama's recent actions. Their leadership would do well to listen. Ms. Telford is a former CIS intern.